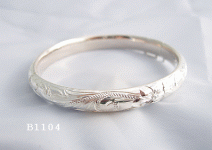 Sterling Silver Hawaiian handcarved bangle with hinge and hatch clasp. The outside of the bangle features detailed hand carved Hawaiian design, including Hawaiian Plumeria (frangipani) and Hawaiian heritage scrolling all around it. This stunning piece of Hawaiian jewelry is of solid sterling silver construction, not hollow. Measurements: The inside circle of this bangle is 178mm (7"), the only size available for this bangle. 7mm wide and 4mm thick. Total weight of 19.8 grams.